1- DISSECTING FORCEP 11.5 CM SHARP POINT. 2- TEASING NEEDLE SHARP STR. 3- B.P HANDLE NO. 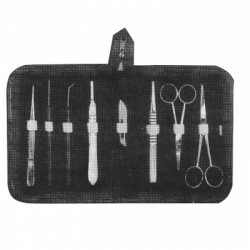 4 4- TEASIN..
1- GROOVED DIRECTOR WITH TONGUE TIE 14 CM 2- PROBE DOUBLE 14CM 3- MAYO HEGAR NEEDLE HOLDER 14 CM 4- ..